Keywords: field studies: Sarracenia flava, new taxa: Sarracenia flava var. 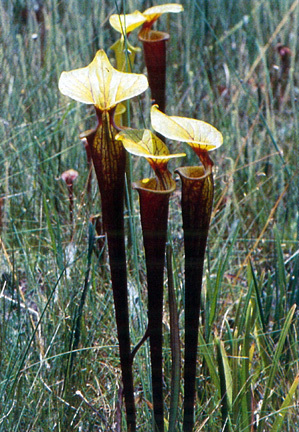 cuprea, Sarracenia flava var. rubricorpora. Since writing a brief note in Carnivorous Plant Newsletter a few years ago (Schnell, 1995) warning about problems applying wrong or inappropriate names to perceived varieties of Sarracenia flava L. and giving a few examples, I have been asked to do a more complete treatment of this problem. At first, the task seemed daunting because of the older literature involved, the seemingly endless proliferation of "names" applied to Sarracenia at all levels by the happy British gardeners of the late nineteenth century, and even what has happened more recently as equally happy carnivorous plant people working in the field and in horticultural efforts all too often merrily call whatever they see whatever they want without research or proper basic documentation. Of course, only a few are guilty of the latter trespass, but their comments tend to become fixed in place over time, lately in particular if they appear on the world wide web! When we speak of variations in S. flava in particular, we mainly refer to red pigmentation—whether there is any; and if so, how it is disposed on the pitcher. Are there veins, the famous "purple splotch" in the throat, any diffuse pigmentation, and how are they interrelated? To some degree, one can also speak of relative pitcher size, lid size and expansion of the upper portion of the pitcher, but my studies show that it all mainly comes down to red pigment, other features being ancillary. Red pigment in Sarracenia is a very complex subject and cannot be evaluated for either genetic or taxonomic purposes in simple presence/absence terms. One must consider several aspects in plants that are a few years old and produce mature pitchers: 1) Presence or absence of red pigment; 2) Extent or amount of red color present; 3) Pattern of red pigment in pitchers and other structures; and 4) "Shade" of red pigment present (which may be noted with the use of extended length standard horticultural color charts if necessary). Red pigment expression and regulation in Sarracenia is very likely polygenic. Very brief mention of a few of the many early writings I reviewed on Sarracenia seems in order to put the problem in perspective. Two interesting early papers are by Manda (1892) and Burbidge (1905). They are fun to read in light of the past and present times, but by themselves would be terribly confusing and misleading. Manda was a horticulturist and read his paper before the Royal Horticultural Society in 1892 on the subject "Insect-eating Plants." When he got to Sarracenia, he listed twenty-five "names" in italics with comment after most (but not all!) as whether they were considered a species or hybrid. There is no indication of what might have been cultivar names and there are no physical descriptions of characters of the plants other than subjective comments on their attractiveness and distinctiveness. Some of the hybrid diagnoses are correct, but many are not. A few S. flava varieties are listed as hybrids, and vice versa. The plant names have no authorities. Some seventeen years later, Burbidge did a paper on the "Trumpet-leaved Pitcher Plants" (1905) and was somewhat more organized with his errors mixed with correct taxa. He listed Sarracenia spp. insofar as they were known then, with varieties and some horticulturally interesting hybrids. But this time the varieties were listed under species and all the claimed hybrids were together at the end of the paper. There was no organized list of references, but a paragraph at the end did mention other literature sources casually. The emphasis in both instances (and many other papers not mentioned here) was on horticulture, not a bad thing in itself, but this emphasis crossed into botanical evaluations as well. If one were interested in a clear history of these plants and relied on these works only and others like them, there would be complete confusion. Just prior to these two articles, Masters wrote in The Gardeners' Chronicle (1881c), providing a much more logical and a clearer listing of the species as they were known in those days, and listing varieties along with authorities and some morphologic description to the extent that some errors could be seen. For example, S. flava var. crispata is clearly a nice description of what we now know as S. alata, and Masters did express some doubt about varietal status and wondered if it might be a distinct species. So, why did not Manda and Burbidge pick up on this knowledge and quality of presentation with their much later efforts? We may never know. Distilled from all this, Macfarlane did the Sarraceniaceae section for Das Pflanzenreich (1908) and pared the numerous varieties (? ), hybrids (? ), etc. of S. flava down to a more acceptable but still not entirely accurate summation. As was the habit in those days, the descriptive portion of his monograph, including com­ments, was written in Latin. For those who have difficulty with Latin, Macfarlane conveniently provided an English adaptation in Bailey (1917). All hybrids were relegated to the end of the monograph. Macfarlane recognized six varieties of S. flava, four of which (including the type variety—see below), in my opinion stand today. The other two are likely hybrids. In more modern literature, the varieties of S. flava are usually listed according to Macfarlane (e.g. McDaniel 1966, Bell 1949). In 1978, I published a paper on S. flava variations in eastern North Carolina which applies to all the eastern or Atlantic coastal plain. I reduced the seeming spectrum of variation then easily seen in this region in massive stands to five genetic variants and concluded that all the others were hybrids of these to varying degree. I did not formally name these variants at the time since my research into this aspect of the old literature was incomplete at the time, and I felt there was little interest. I referred to the variants by distinctive (now well-used) informal designations in double quotes, such as "typica", "all red", "heavily-veined", etc. Since then, using similar methodology as in my 1978 study (see original paper for details), I have come to recognize two additional basic varieties on the Gulf Coast to report here. In the interest of clarification, I am now prepared to assign appropriate varietal epithets to these seven true varieties, five of which are older applicable designations, and two which, although well-known informally, are herein described and published with varietal epithets for the first time. Varietal status, rather than the higher subspecies level, was chosen for two combined reasons. 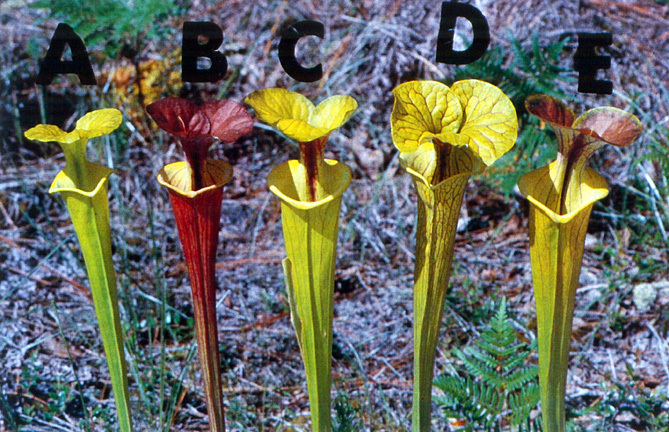 First, it is my opinion that the variations are not of sufficient degree to warrant the higher status, particularly when considered alongside other Sarracenia species infraspecific classification. Secondly, I tend to follow the taxonomic school of thought that subspecies designation is generally reserved for variant groups of a species that are mostly geographically separated (allopatric), and variety used for those variants which occur in the same area or even within a population (sympatric). 6) Sarracenia flava L. var. cuprea Schnell, var. nov.
Operculo folii urceolati externo cupreo vel ferrugineo atque parte superiore 1/4 tubi urceolati externi prominente cuprea vel ferruginea distinguenda. External lid of the pitcher and sometimes upper 1/4 part of the external tube prominently copper-colored or rust-colored. TYPE LOCALITY. United States. North Carolina. Brunswick County, off State Rt. 211: wet savanna. Herbarium material collected 1 July 1998 from cultivated plants, D.E. Schnell s. n. (HOLOTYPUS: US). ETYMOLOGY. Epithet cuprea refers to "copper color." RANGE. Southeastern coastal plain, most prominent in North Carolina and South Carolina, rare in northwestern Florida. HABITAT. Open or moderately shaded pine savannas, drainage ditches, seep bogs and along shallow, meandering streams. 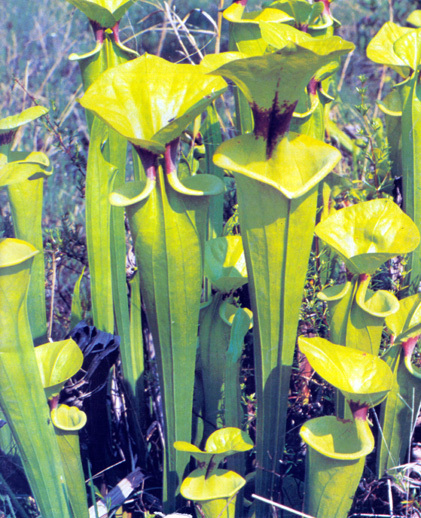 7) Sarracenia flava L. var. rubricorpora Schnell, var. nov.
Folio urceolato extus atrorubro, intus superne flavido-bubalino, operculo flavo-viridi et venationem prominente rubram habente distinguenda. Pitcher tube externally dark red, internally yellowish-buff, the lid yellow-green and having prominent red venation. TYPE LOCALITY. United States, Florida. Liberty County, herbarium material collected 1 July 1998 from cultivated plants. D.E. Schnell, s.n. (HOLOTYPUS: US). ETYMOLOGY. "rubri-" being red, "-corpora" referring to body of pitcher tube. RANGE. Restricted to northwestern Florida. HABITAT. Open or moderately shaded pine savannas, ditches and seep bogs. I recognize seven varieties of S. flava worthy of naming, the remaining color and vein presentations of a seeming spectrum in some locations being varietal hybrids or backcrosses, or ecophenes. Five of these—predominantly in the Atlantic coastal plain—were studied and presented in my 1978 paper with informal designations applied until further "library research" could match older formal varietal designations to some of these. One is given the "default" varietal designation var. flava, three are matched with previous formal descriptions and varietal names, and one new formal varietal description herein published. On the Gulf Coast, not covered in my 1978 paper, two unique genetic varieties are discerned, one matching a previously published varietal epithet, and the second being formally described herein. All seven of these varieties can now be referred to by formal, accurate varietal names, and there should no longer be confusion about what epithet applies to what variant. Bell, C.R. 1949, A Cytotaxonomic Study of the Sarraceniaceae of North America, J. Elisha Mitch. Sci. Soc., 65: 137-166 plus 14 plates. Burbidge, F.W. 1905, The Trumpet-Leaved Pitcher Plants, Flora and Sylva, 3: 296-306. Macfarlane, J.M. 1908, Sarraceniaceae. In Engler, Das Pflanzenreich. IV. 110. Macfarlane, J.M. 1917, Sarracenia. In Bailey, Standard Cyclopedia of Horticulture, Macmillan, New York. Vol. VI, pp. 3078-3081. Manda, A.J. 1892, Insect-Eating Plants, J. Roy. Hort. Soc., 15: 135-143. Masters, M.T. 1881a, The Gardeners' Chronicle, 2. ser. 15: 817. Masters, M.T. 1881b, The Gardeners' Chronicle, 2. ser. 15: 628. Masters, M.T. 1881c, Sarracenias, The Gardeners' Chronicle, 2. ser. 16: 11-12, 40-41. University Microfilms, Ann Arbor, Michigan, No. 67-345, pp. 1-128. Schnell, D.E. 1978, Sarracenia flava L.: Infraspecific Variation in Eastern North Carolina, Castanea, 43: 1-20. Schnell, D.E. 1995, Sarracenia flava Varieties: Do We Know What We Are Talking About?, Carniv. Pl. Newslett., 24: 48-49. Figure 1: A. S. flava var. maxima, B. S. flava var. atropurpurea, C. S. flava var. flava, D. S. flava var. ornata, E. S. flava var. cuprea.